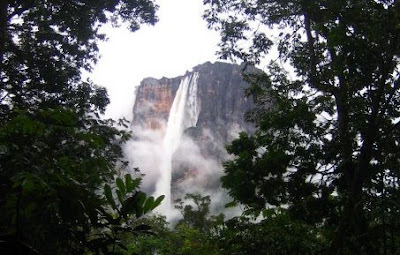 In Humboldt's Footsteps: Will Angel Falls become one of the New 7 Natural Wonders? Will Angel Falls become one of the New 7 Natural Wonders? Will Angel Falls become one of the New 7 Wonders of Nature? It seems like the voting has been going on for ever but there's not long now before we find out if the world's highest waterfall and Venezuela's greatest tourist attraction has made it into the Top 28 finalists. All voting is currently on hold, as the New7Wonders panel of experts considers the TOP 77 nominees from the second phase of the online voting that ended on 7 July. The panel's decision on which of the 77 nominees make the list for the 28 Official Finalist Candidates will be announced on 21 July at seven minutes past midday gmt. Angel Falls is the only Venezuelan natural wonder to make it into the Top 77 in the category for Lakes, Rivers and Waterfalls. Other succesful South American candidates include the Galapagos Islands in Ecuador, Iguazu Falls shared by Brazil and Argentina, Kaietur Falls in Guyana, the Atacama Desert in Chile and Lake Titicaca shared by Bolivia and Peru. After the 28 finalists have been revealed on 21 July, voting will then resume again to decide the final seven Wonders of Nature. The organizers estimate that by the time the finalists are revealed in 2011 over 1 billion votes will have been cast. Back in 2007 more than 100 million people from all over the world cast votes for hundreds of architechural gems in a search for the 7 New Wonders of the World. The final seven were Machu Picchu in Peru, the Pyramid of Chichen Itza in Mexico, Christ the Redeemer in Rio, Brazil, the Colosseum in Rome, Italy, the Great Wall of China, the ancient city of Petra in Jordan and the Taj Mahal in India. Fingers crossed for Angel Falls on 21 July and thanks to all who voted. It's so nice to read about foreigners that love our country. Sometimes even we forget to do so. Thank you for this, Russel.